What’s even better than a reversible leopard ruana? 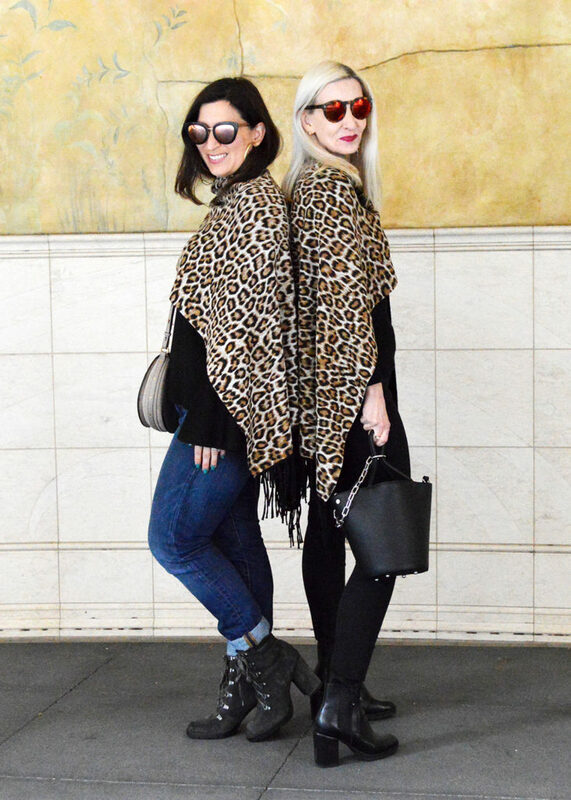 TWO reversible leopard ruanas … and wearing them together with your blogging bestie for some fun pics! This week Cathy of Bay Area Fashionista and I met up for some coffee, pastries, and girl time. A big thanks to her daughter who tagged along, put up with all our blog talk, and took these fun pics! Chico’s sent this fun ruana to some of us bloggers as a holiday present. You might have seen other bloggers you follow wearing it on their blogs or Instagram. It’s a cool piece, reversible with leopard on one side and black on the other. I find anything leopard never really seems to go out of style, right? I think this would be a versatile piece to add to your wardrobe. It can be worn as a cape, a scarf, and on either side for lots of looks! I noticed Jess of Elegantly Dressed and Stylish is wearing her fabulous cape as well! How’s is everyone’s week going? I hope 2018 is starting off super fabulous for you all! What a great gift from Chico’s! Love that it’s reversible. You are both leopard lovelies!!! What a fun day for two great Bloggy Babes!! I love leopard and that’s a great piece. The pics are great! They are amazing, aren’t they?? I tried layering mine over a solid colored coat to give it some interest!! I love it! It looks like you hd fun! I think I need to get one too! Love the leopard print. So chic! Thanks for the link up! You both look adorable. What a fun afternoon that must have been…even for your tagalong. 😉 The scarf/wrap is gorgeous and I love your jeans! 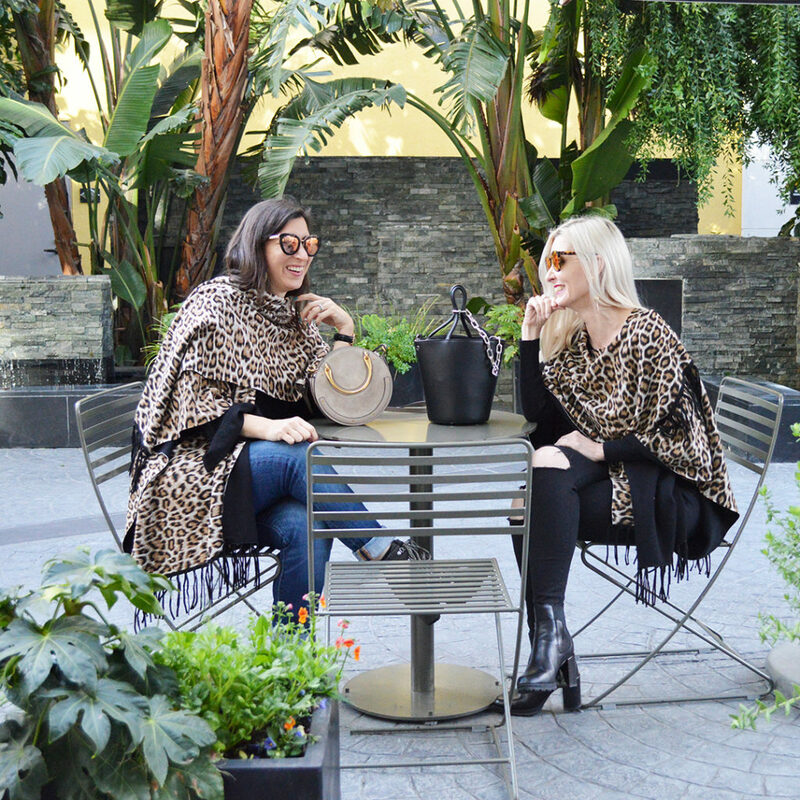 How fun to twin with a blogger friend! I love the leopard print wrap, and that it’s reversible! You guys look so fabulous! I love that wrap and especially with an all black look. Happy Friday! How fun to meet up with your blogging bestie! I love that you wore the same thing! This blanket cape is nice for California. Here in Alaska, it would have to serve as a coverup over a coat on a very, very cold day. Too bad we don’t have a Chico’s up in Alaska. Dawn, I love this piece and how you can style it! Thanks for featuring me. Love it on both of you, and it looks like a fun day. Such a fun post seeing how you both styled this ruana! It’s amazing how the accessories you pair with it really change the overall look. So chic but with plenty of attitude too! How fun to be twinning the Chico’s reversible ruana! I love how it can be styled both ways! I love this post! You all are so glam in your leopard! How fun to have some girl time too. What a great piece! You all look so chic! Have a great weekend! Love how both of you are twinning! I love animal print especially in fall and winter. 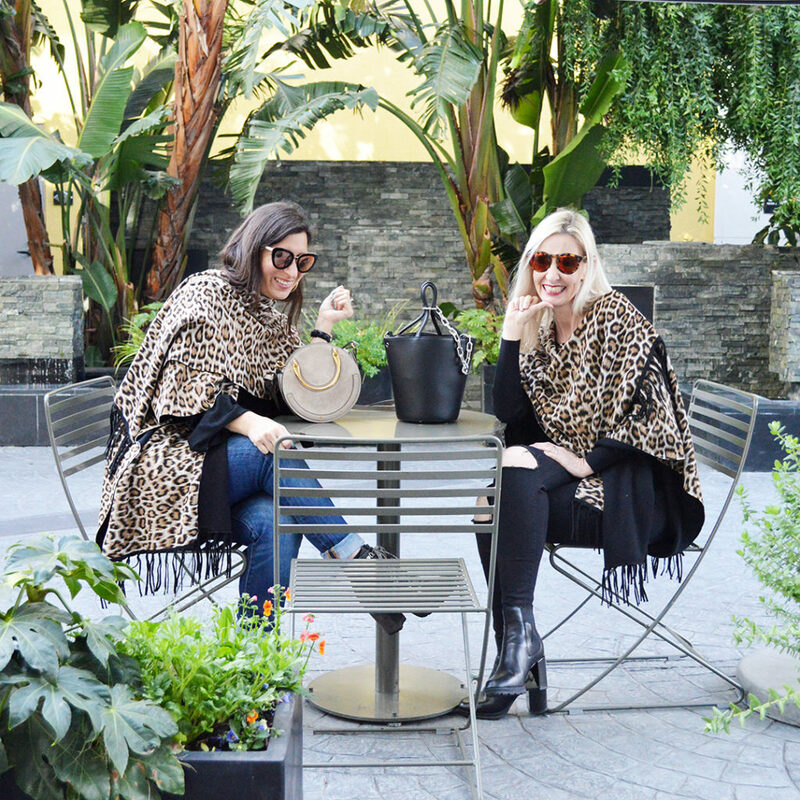 You both look great in this leopard print ruana! It definitely adds variety and sophistication to your outfits. It’s fun to see other bloggers getting together and socializing, I want to do that in the future once I finish graduate school! You two are so cute! I wore mine last night! Love it! 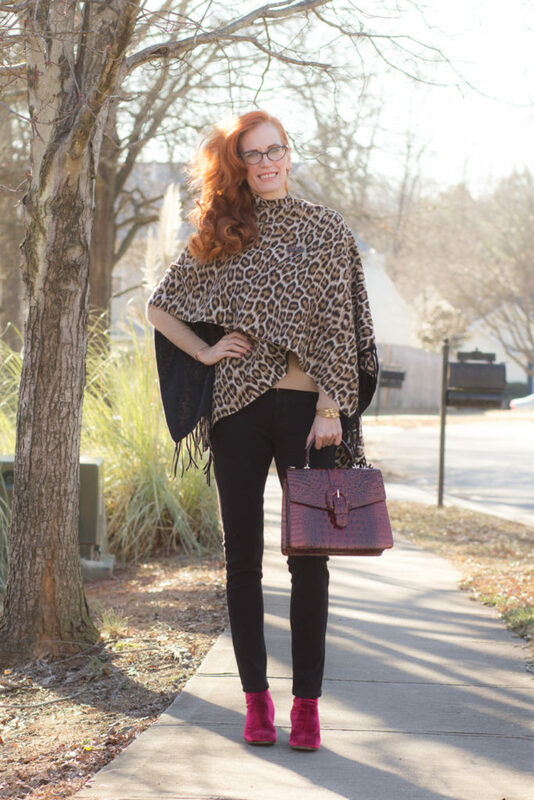 One leopard wrap is fabulous and two is even better! You both look purrrfect! I use to shop at Chico’s alot but haven’t been in awhile. I love this look! Keep it fun and flirty girls, yas! Totally obsessing over these Jambu Antia Water-Resistant Booties!!! Ordering them now.